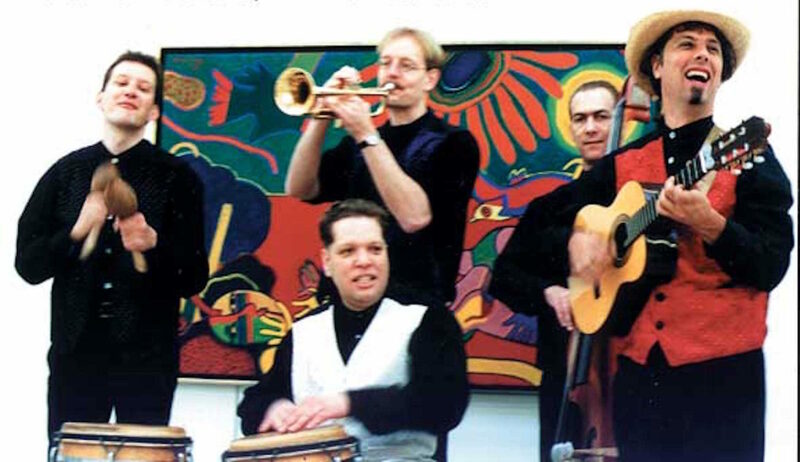 Since its formation in 1989 as an Afro-Cuban folk band, Rumbanana has gradually metamorphosized into a group playing Afro-Cuban rhythms like Guaguanco, Comparsa and Bembe. The combination of tres, contra-bass, percussion and trumpet ensures that the band delivers an authentic Caribbean sound. Before its formation, the band members had, individually, years of practical experience playing with different South-American and Caribbean bands. Above all, most are graduates of the music academy in the Netherlands. The leader of the band is the flamboyant “El Guayabero”, who grew up partly in Spain. Together with the other members of the band, he works his audience into a melodious frenzy. Apart from dance music, Rumbanana has a full repertoire of songs specially composed and rendered just for the listening pleasure. Its musical repertoire includes various Caribbean and South American dance styles like Salsa, Merengue, Cumbia, Calypso and Samba, just to mention a few. Rumbanana is a merry-go-round group that plays unforced and varied music which invites its lovers (and even those not familiar with this music genre)to the dance floor. One unique aspect of this band is that it can also, on request play acoustic sets on different spots for small or big events. Rumbanana hasn’t played for 10 years, but is going to perform again in 2018! We are not the French all-women salsa band Rumbanana, formerly “Les Rumbananas” :-).